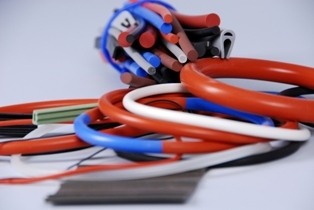 Our Precision Spliced O-Rings and Extrusions are available in any size, shape, or compound. Manufactured in continuous lengths - our profiles include cord, tubes, squares, rectangles, multi-lobe, and custom shapes. Precision Spliced Custom Extrusions are our specialty! We can fabricate to any specified Inner Dimension (ID), Cut Length (CL), or Custom Shape. We specialize in 45 and 90 degree angle splices, then permanently vulcanize to provide an extremely strong and uniform bond. Like our molded O-Rings, all Precision Spliced O-Rings and Extrusions are designed using carefully formulated rubber compounds. Supported by inventory unmatched in the industry, shipments are typically available within two to three working days. Royal Seal compounds are available in a variety of hardness ranges (30-90 Shore A) and include Silicone (VMQ), Fluorosilicone (FVMQ), Fluorocarbon (FKM), Ethylene Propylene (EPDM), Neoprene (CR), Nitrile (NBR), Urethane (UE), and many Thermoplastic Elastomers (TPE/TPU). If your requirements call for Precision Spliced O-Rings or Extrusions – and you need them in a hurry – call Royal Seals, Inc.